Last week's blog offered 10 ways to cleverly use mason jars at your wedding at our rustic wedding venue near Knoxville. Unless you choose to give them away as favors to guests, you are going to end up with a lot of mason jars after the wedding to take home. You could try to resell them to another bride planning a rustic wedding of her own, but there are plenty of great things you can do with the jars you decide to keep. Country Jewell has a few of those ideas for you here today. Line your kitchen counter or cabinets with jars full of small snack items. It makes a pretty display in your kitchen and your snacks can be grabbed quickly when you get the munchies. These jars work perfectly for holding treats for your pets too. 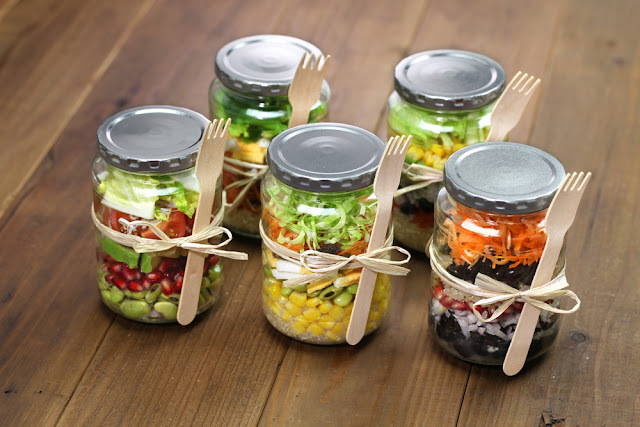 Mason jars also work well for packing lunch items. Salads can be layered in a way so that the dressing doesn't soak everything else before you eat it. At lunchtime, all you have to do is shake it up and pour it out onto a plate, or you can even eat it right out of the jar. As long as the lid has a good, tight seal, it makes a great soup container too. There are lots of gift-giving opportunities throughout the year, so having a stash of mason jars for "gift boxes" is be a good thing. You can give away mini "spas" in a jar by filling it with nail polish, emery boards, lotions, bath gels, etc... They are perfect for filling with tasty treats too, and no one can resist getting food as a gift! There are also lots of tutorials online for filling mason jars with the dry ingredients for a recipe, all layered in an attractive way with the recipe tied to the lid. These handy jars are nice containers to line your kitchen window with also. Fill them with a bit of dirt and plant your favorite herbs inside. Then you will have fresh herbs for cooking anytime that you need them. Foods like pasta and rice often come in a bag that is not resealable. 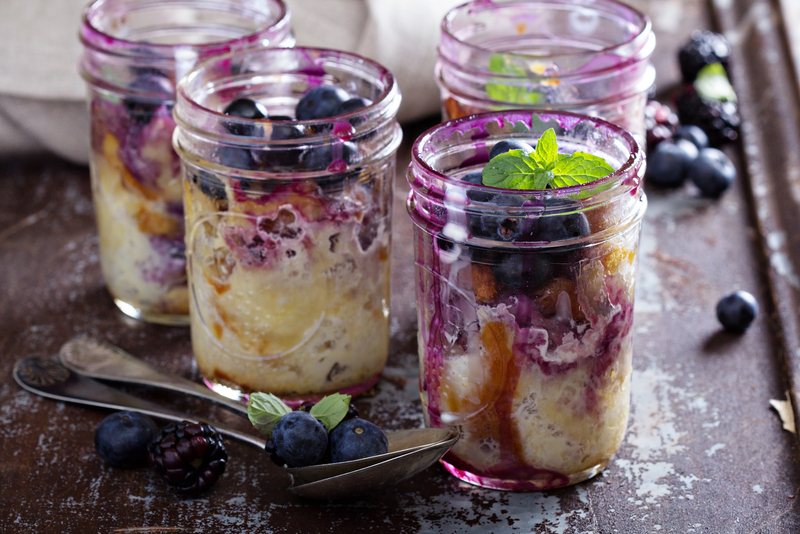 Any leftover dried goods that you have can be stored nicely in mason jars. Baking ingredients, such as flour and sugar, can be kept in these jars too. You know how those Parmesan cheese containers from the store have a lid with holes you can shake the cheese out of? That same lid fits most mason jars perfectly! Glass can go into an oven, which means filling a mason jar with cake batter, bread dough, or muffin mix will result in fresh and hot treats you can serve straight out of their baking container. We have even seen some recipes that allow you to bake a wonderful single-serving pie in them. Getting out of the kitchen and into other rooms in your home, mason jars are excellent at containing all sorts of household items. You can leave them plain so that the things inside are clearly visible, or you can get crafty and decorate them with paint, ribbons, or lace. On your desk, long items like pens, pencils, and scissors can be stored in an open jar, and smaller things such as paper clips, staples, and thumbtacks can be contained by adding the lid. Just like on your desk, there are lots of things in the bathroom that can be kept neatly in a mason jar. Q-tips, cotton balls, makeup sponges, brushes, combs, bath salts... all sorts of things! The next time that you empty a shampoo or lotion bottle with a pump on top, save it. You can find lots of fairly easy tutorials online that instruct you on how to add a pump to the lid of a mason jar. Once that is done, you will have a reusable dispenser for soaps, lotions, and more. If you like to go camping, use your jars to store matches so that they stay nice and dry. They are also great for keeping the scents from aromatic foods locked away so that animals aren't tempted to visit and examine what you're eating. 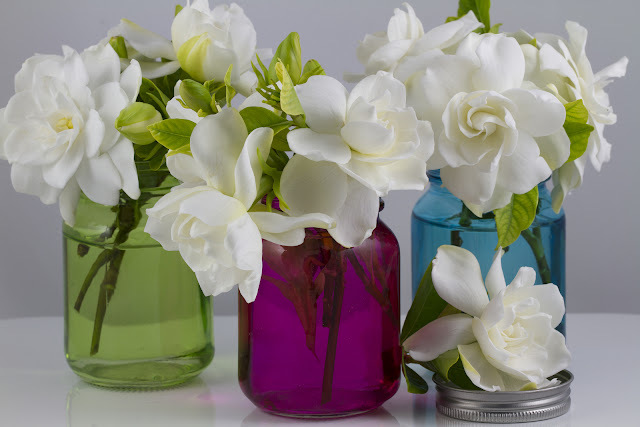 You can also use your leftover mason jars all around your home in the same ways you used them at your wedding, filling them with candles or fresh flowers. As an added bonus, every time that you see one in a room, it will remind you of your very special wedding day! We love seeing all of the creative things that people do with mason jars at our rustic wedding and event venue in Tennessee. If you've come up with some cool things to do with the extra mason jars after your own wedding at Country Jewell, we'd love to see those too. We bet you've got a few more great ideas that we didn't even think of.